A reaction of biomolecules had been studied, including an effect of albumin molecules on THz electromagnetic waves on frequencies of active cell metabolites (nitrogen oxide 150.176-150.664 GHz and atmospheric oxygen 129.0 GHz). Change of conformational molecule state had been displayed. Kirichuk VF, Tsymbal AA. Biological effects of THz electromagnetic waves on frequencies of active cell metabolites at a molecular level. Russian Open Medical Journal 2013; 2: 0405. The performed experiments in interaction of THz electromagnetic waves on frequencies of active cell metabolites with bioobjects let us reveal a number of positive effects of the given waves which could be used in clinical practice . The great scientific interest provokes the study of mechanisms of these effects realization. The THz band (100 GHz – 10 THz) is interesting by the fact that emission and absorption spectra of the most significant cell metabolites (NO, O2, CO2, CO, OH-, etc.) are concentrated in this band [2-4]. The fundamental base of a functioning of complex biological systems is molecules-metabolites, stable and directly reproducible molecular structures of biological media. So, determined radiation control of their reaction potencyб which coincides with their emission and absorption spectra, can influence the process of metabolism in biological media. The analysis of biomedical effects of electromagnetic waves of molecular spectra of atmospheric gases-metabolites demonstrates a direct connection of mean metabolite spectra and its properties in biological media. This corresponds to an idea of a substance and a field as of a union system [1-5]. Today there are several methods of explanation of mechanisms of influence on biological objects (at molecular, cellular and organismic levels) of millimeter and submillimeter electromagnetic irradiation (EMI). A special interest generate molecular mechanisms of the given electromagnetic waves reception [3, 5]. The study aimed a research of biological response (at molecular level) on THz electromagnetic waves of active cell metabolites frequencies. 2.5% water solution of human albumin was used. The albumin irradiation had been organized in plastic transparent tubes during 30 minutes by THz waves of 150.176-150.664 GHz nitrogen oxide and 129.0 GHz atmospheric oxygen frequencies. The process of the irradiation had been performed with the help of a portable medical THz device “Orbita” (Central Research Institute of Measuring Equipment, Saratov, Russia). Molecular spectroscopy, fluorescent albumin spectroscopy in particular, had been performed with the help of the single-beam luminescent spectrometer (LS 55 Fluorescence Spectrometer, PerkinElmer Ltd., USA). Follow fluorescence mode was used: spectral width 15 nm×15 nm, scan speed 500 nm/min, excitation spectrum was fixed at luminescence of 420 nm, spectral analysis had been done within 250–320 nm of wave length. At the irradiation of 2.5% water solution of human albumin by THz waves of 129.0 GHz atmospheric oxygen frequencies during 30 minutes, there had been denoted the following spectral change. Absorption: no change of spectra forms, only amplitude changes. Excitation: only fringe amplitude changes, this may be connected with tryptophanyl change, which in turn is caused by globules structure change. In this case there is degree of luminescence quenching changes (Picture). By the method of fluorescence spectroscopy, there was showed that at a 30-minute irradiation of 2.5% water solution of a human albumin by THz waves of 150.176-150.664 GHz nitrogen oxide, there were three fringes in excitation spectrum: phenylalanine 258 nm, tyrosine (275 nm), tryptophan (297 nm). As it had been registered a luminescence of tryptophan rests (420 nm), which is fed up by transfer of excitation energy from phenylalanine and tyrosine to tryptophan. The change of correlation of fringe amplitude changes displays changes in the efficiency of energy transfer. This can be explained by change of a spatial configuration of protein globule under the radiation exposure. An increase of 275 nm fringe shows a decrease of an interval ”tyrosine – tryptophan”. A total increase of fringe amplitude may be caused by a reduction of luminescence quenching stimulated by a decrease a water approach to a luminescence area (Figure 1). 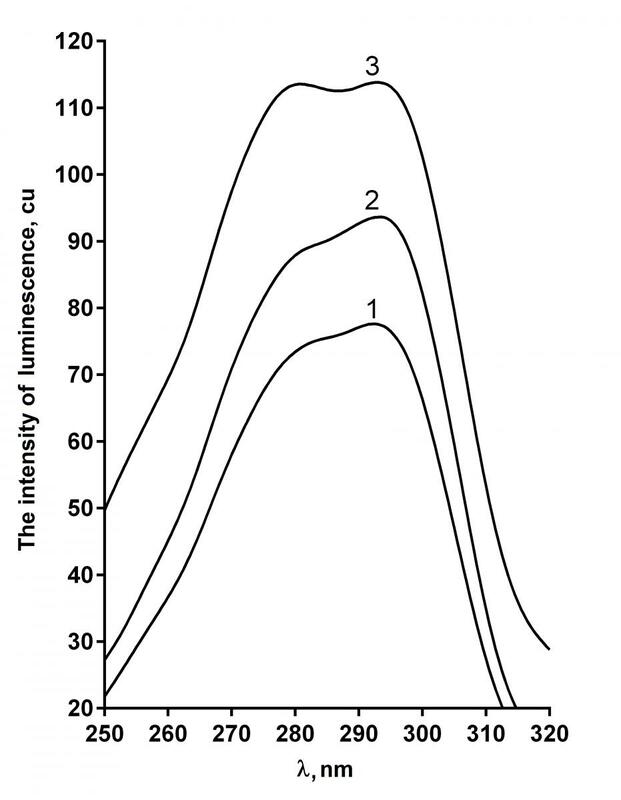 Figure 1: 1 – test with intact albumin; 2 – albumin under 30-minute 129.0 GHz irradiation; 3 – albumin under 30-minute 150.176-150.664 GHz irradiation. Thus, the method of a molecular (fluorescent) spectroscopy confirms that the THz irradiation of active metabolite cells frequencies induces conformational changes in biopolymers molecules, albumin as well. Change of conformational condition of albumin molecules is caused by rovibrational transfers. This is the response that should be expected, as in submillimeter THz waves there are natural frequency of rovibrational transfers of waterand various biologically active macromolecules with a complex three-dimensional organization, as well as proteins and nucleic acids, and mode of hydrogen binding [6-8]. These transfers stimulate rotation of functional groups of atoms around chemical bondings, change of bond angles and hydrogen bond strengths. All these cause conformational change of these molecules. At the same time irradiation of THz submillimeter band is easily absorbed by water solvation shell, which surrounds a biopolymer molecule. Absorbed energy induces rovibrational transfers and change hydrogen bond energy. That is what specifies a conformational transfer. As a result an absorbed energy does not dissipate but transforms into energy of conformational transfer . Conformational transfers cause the change of functional characteristics of biopolymers, this determines a degree of their biological activity . From the above we can conclude that change induced by THz radiation at molecular level, can produce different intracellular and intercellular reactions, which, eventually, will be integrated into a cascade of biochemical and physiological responses at the level of a whole organism. This hypothesis is reasonable, as the responses to a radiation of submillimeter THz band have a direct evidence, as at a cellular as at an organismic levels .